The focal point of this work is an original mixed media painting on canvas. The image is not a print. It is an original one of a kind work of art. It is made in the same manner as my larger works, but measures only an inch square. 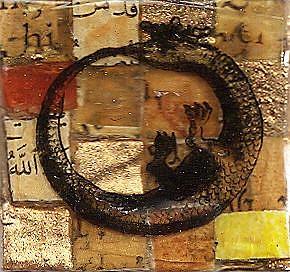 A perennial and pivotal symbol from alchemy, the ouroboros, has intrigued me for a long time. A mystical allegory of eternity, the universe, and perhaps all things cyclical, it is above all else a beautiful symbol. This is a deeply-layered work on canvas comprised of tiles of antique paper, glazes and gold leafing, and the drawing, based on a medieval engraving, is transferred to an upper layer before the final glazes are applied. The completed work is set into a pewter bezel of silver hue and suspended from a fine silver necklace chain with a lobster-claw type clasp. 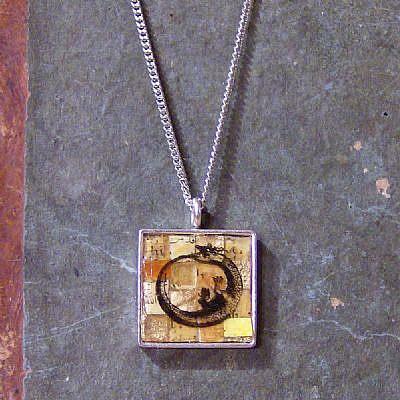 My work in jewelry combines the same processes I use to make my mixed-media paintings with the materials and process used in adornments. 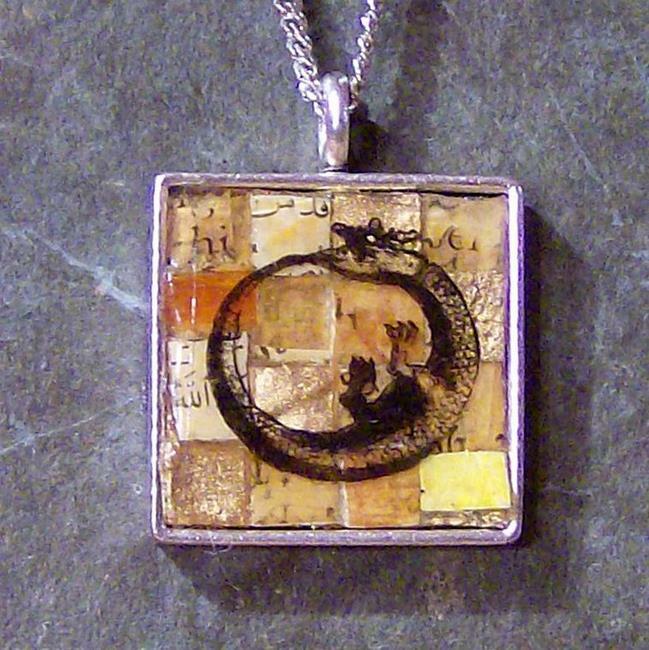 As the work evolved over the years, I became fascinated with working small. My main body of miniature works seemed perfect displayed in frames, but as I created ever smaller works, I had to explore new contexts for presenting them. 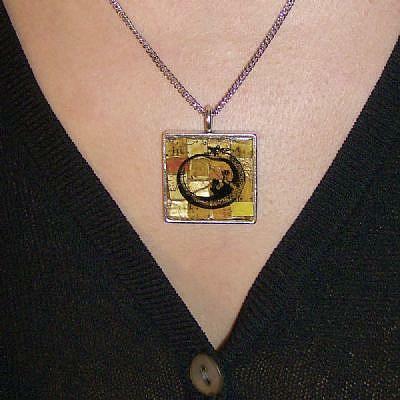 The surfaces I create have often been compared to amber or described as a small artifact or icon. Jewelry became the natural and obvious answer, and it also opened up an opportunity to learn about and work with metals, and to explore the synergy between my pieces and their settings.